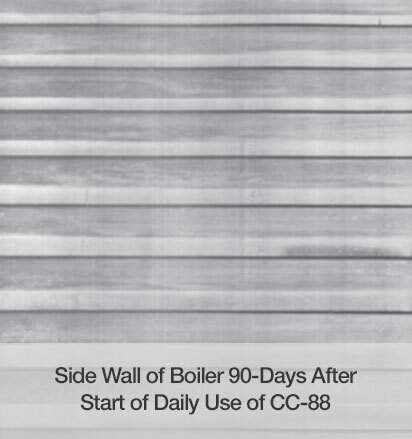 CC-88 offers clean coal combustion and reduces harmful emissions. It helps improve energy efficiency and reduces your operating costs. Using it would eliminate carbon waste, which improves coal fired boiler performance by reducing slagging and fouling of the boiler system. In Chemistry Catalysts Speed Up Chemical Reactions. CC-88 works in the same way. CC-88 is a Combustion Catalyst. During the coal combustion process the oxidizing properties in CC-88 promote the increased movement of free radicals. CC-88 helps to promote the physical and chemical reactions that occur during combustion. CC-88 speeds up propagation and movement of free radicals. This releases more oxygen to the carbon contained in the coal, and at lower temperatures than normal combustion temperatures. The net effect is to add nothing to the carbon oxygen chemistry, just to speed it up. 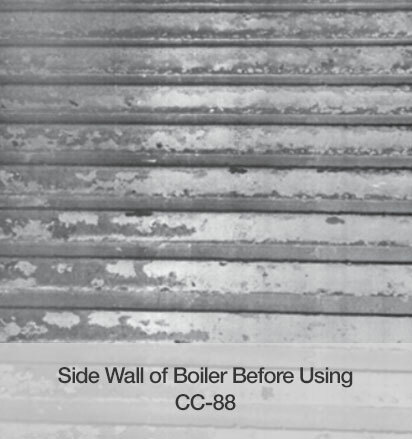 CC-88 speeds oxidation, helping to eliminate incomplete and inefficient combustion. CC-88 turns more of the available carbon contained in any fuel into valuable and usable heat energy. CC-88 allows the carbon molecules contained in coal to better use oxygen during the combustion exothermic reaction. CC-88 allows oxygen molecules to attach to the carbon molecules much faster, at lower temperatures, and more easily than during normal combustion conditions (without CC-88). CC-88 lowers the fuel’s ignition temperature, burning fuel with less effort and more thoroughly. The lowering of the particulate emission is very significant in having the plant meet a >200 Mg/Nm3 particulate emission and in helping to clean the atmosphere of particles forming acid rain and causing the constant haze over the City of Mianyang. The Return on Investment (ROI) for HTT resulted in a 4.91% net coal cost savings, adding value to the plant’s bottom line. The reduction of carbon and heat within the fly ash and bottom ash indicates an excellent reaction of the CC-88 catalyst with the coal in the furnace and provides backup to the percent improvements in combustion efficiency and reduction in coal demand.